Tony Blair and George W. Bush shake hands after their press conference in the East Room of the White House on १२ November २००४. Gordon Brown, pictured in २००२, was Chancellor under Blair, with whom he made a pact to succeed as prime minister. ↑ "Tony Blair". Tony Blair. http://www.britannica.com/eb/article-9003134. 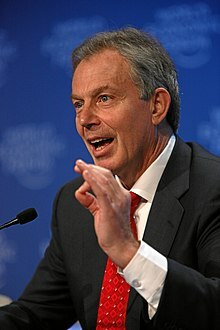 Hansard – Prime Ministers Question Time, २७ June २००७ – Official transcript of Tony Blair's final appearance in the Commons containing a mix of day to day business, tributes, quips and light hearted put downs.